CanadaVetExpress wishes a happy Halloween to all the pet owners of the USA. It seems as if just yesterday fall started, and here comes Halloween. This day was originally an Irish festival when the lost souls were believed to cross our world and were remembered in the prayers. However, now the festivities of Halloween have completely changed and things are just made spooky using costumes, carved pumpkins, visiting haunted places, watching horror movies etc. Where everybody will be enjoying this day of trick or treating, pet owners might have a hard time in calming the pets with all the hustle bustle of parties. 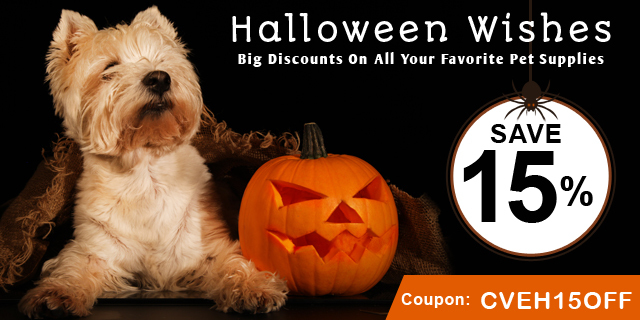 To add some excitement in the atmosphere during Halloween, CanadaVetExpress has a discount offer of 15% for all pet owners. Let’s check what has CanadaVetEpress on the racks and what the benefits of Halloween sale are! CanadaVetExpress is one of the most popular pet supplies stores in the USA. Being in the market for only a year, the level of achievement and appreciation is quite higher than expected. Pet owners have widely accepted us as their trusted store as we have always focused on providing the peerless brands at discounted prices with the same authenticity and service. You may find our virtual racks filled with health products for cats, dogs, and birds. The leading brands fill the categories of flea and tick, heart wormers, joint care, and wormers. Parents of feathered pets have put their trust on our products as we have a big range of treatments for different condition in birds available at cheaper rates. The negatives of NOT taking an advantage of Halloween sale! CanadaVetExpress is stocked with a number of products. It may not be possible for you to try a new treatment on a normal purchase. But, Halloween discount of 15% can let you buy that product at lesser cost which is suitable for trying. Thus, you may lose this chance if you opt not to shop on Halloween Sale! If you are a returning customer and buy the same treatment every time, this could be the best opportunity to stock on that favorite product. If you let this chance slip, you may have to pay 15% extra on a normal purchase. We do not ask for shipping sum, be it your smallest order, say of only $1. If you unnoticed this sale, you may have unnoticed a moment of saving. We ship to the remotest corner of the country without a penny as shipping cost. This sale could be a bonanza saving occasion for you. We already sell the pioneer brands ad discounted rates. Thus if you blow this chance, you blow a saving bonanza of buying a product at already discounted rates + 15% OFF + free shipping. In all, you may miss a lot if you miss this Halloween sale at CanadaVetExpress. Thus, bag your favorite brands and save big. Use coupon code: CVEH15OFF while checking out. PREVIOUS POST Previous post: Planning To Get One More Kitty? Tips And Concerns To Deliberate!